What do Night Parrots sound like? Where should I be listening? 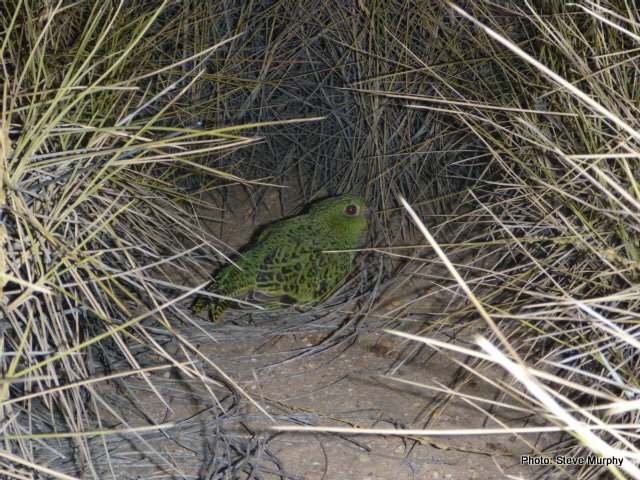 There are very few recent confirmed records of the Night Parrot, but thanks to the considerable efforts of John Young, a highly skilled naturalist, we now know of the continued existence of a population centred on the Diamantina National Park – Pullen Pullen Reserve area in western Queensland. It is assumed that the species exists as small isolated groups or as a small loosely-connected population. Until surveys detect many more Night Parrots, the recovery team assumes that the species is highly threatened, and potentially at the brink of extinction. Any disturbance of Night Parrots could result in breeding failure, compromise individuals by increasing metabolic stressors at times when extreme environmental conditions prevail, or expose the bird to predation, any of which may decrease the species chances of survival. 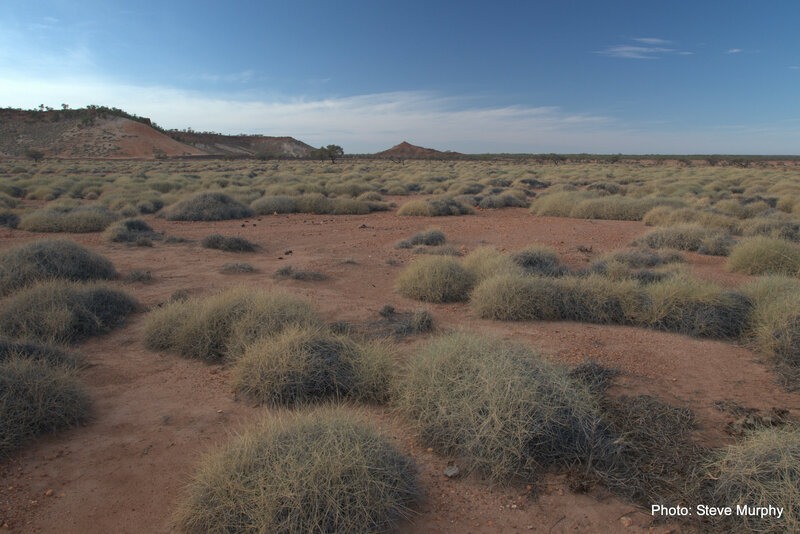 Because of the risks associated with disturbance, the recovery team has maintained a policy of minimal disturbance for research and surveys for the Night Parrot. The key method used is passive observation and listening, supplemented by habitat surveys, and remote image analysis. To date, two birds have been captured to collect biological measurements and to radio track their movements. The recovery team’s recommended birdwatching/survey methods are based on avoiding any unnecessary disturbance to Night Parrots. 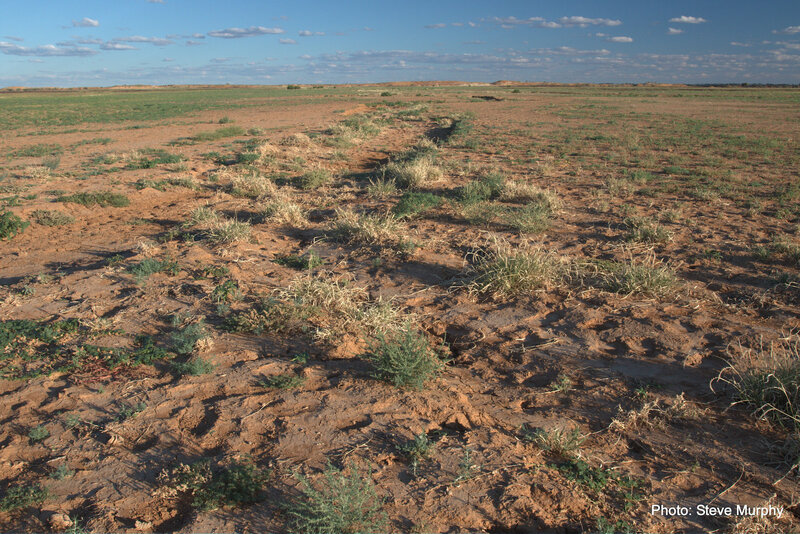 The recovery team encourages survey and birdwatching for the Night Parrot, so that we can learn more about the distribution and conservation needs of the species. 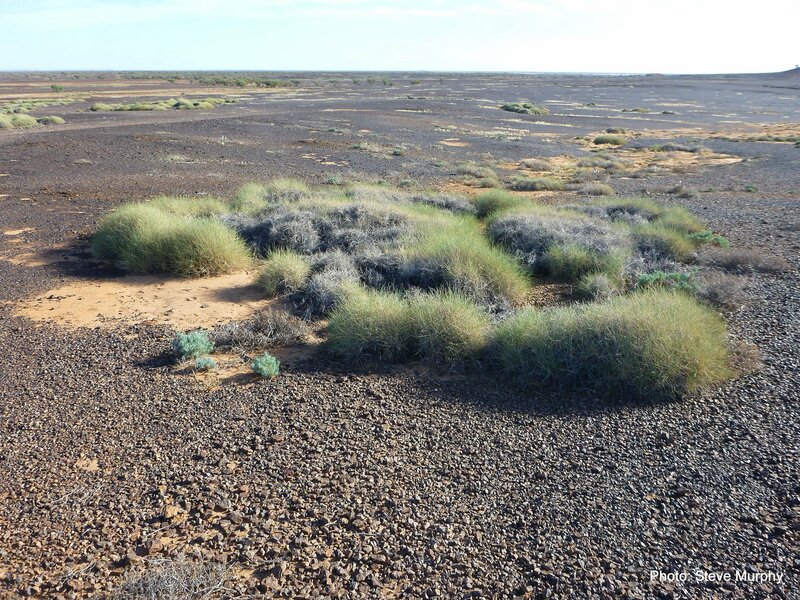 Steve Murphy and Fortescue Metals Group (who have funded most of the research to date) have generously made the most common calls available to the Night Parrot Recovery Team to openly distribute them to anyone willing to use the recommended methods and report their findings. 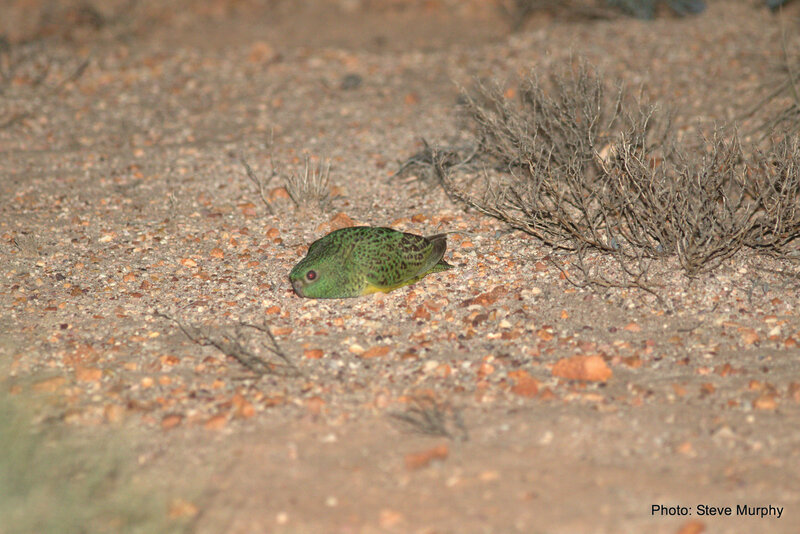 Please note that the calls of the Night Parrot were not previously released at the request of State and Australian Governments due to concerns about the potential impacts associated with disturbance to and poaching of the Night Parrot. 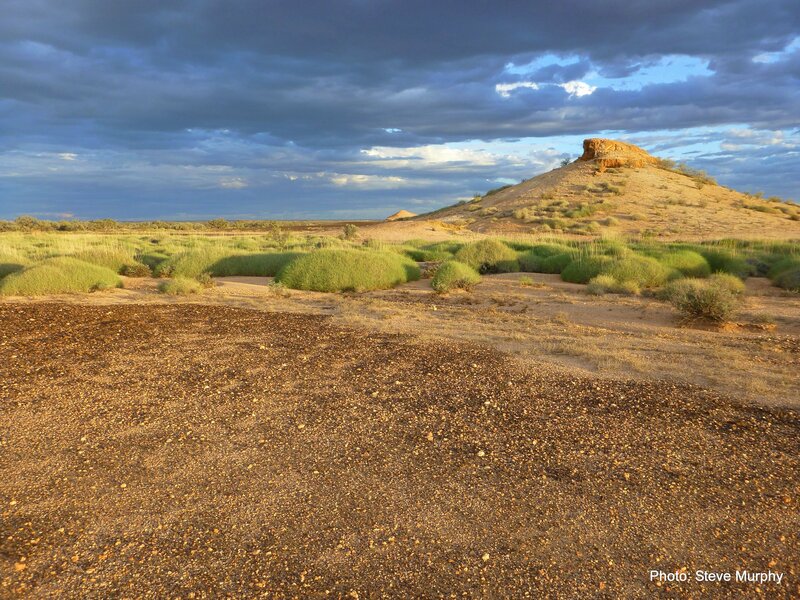 The key locations where the Night Parrot is found are under active conservation management and have statutory protection that controls access to these locations. In south-western Queensland, Night Parrots are known to make a variety of calls. One type of call is a clear, ringing, bell-like whistle given either as one, two or three syllable phrases. Another type of call comprises more mournful and subdued tones, normally given in four-syllables, although sometimes only one or two. Whistling calls can be heard up to 500m away, depending on the conditions. The other main call heard is a short-range ‘croak’ call. This is given as a contact call or when birds are flushed. There also may be other calls not yet recorded. Night Parrots will often call to one another and will also respond to hearing a recording of their call broadcast from small speakers (although see notes below about the use of call-playback). They are known to fly in towards a calling bird and settle nearby. 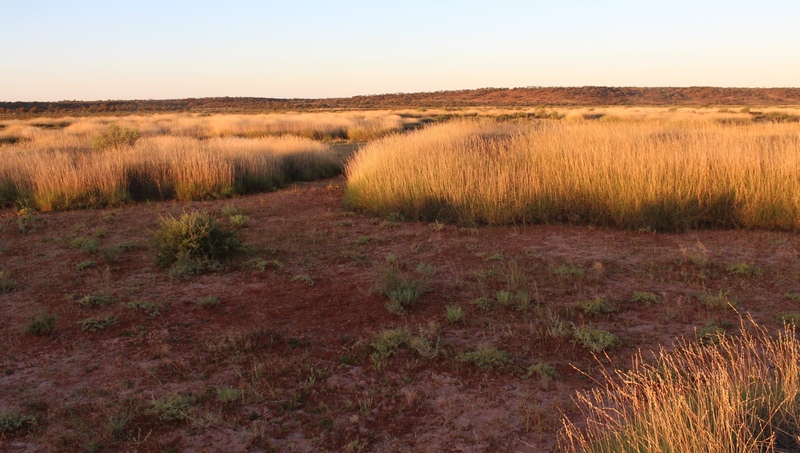 In dry times, individuals or pairs call from spinifex (Triodia) roosting habitats mostly in the first hour after sunset and the last hour before dawn. Sometimes only a few calls are given during these periods. During the rest of the night, Night Parrots normally move into other habitats to feed. During and immediately after wet times, Night Parrots call more frequently. There are still peaks of calling at dusk and dawn, but there also tends to be more calling through the night detected in Triodia. Night Parrots are known to drink at free standing water, and may do so more in hot weather. In cooler weather, individuals may obtain their water requirements from succulent plants, such as Sclerolaena longicuspis. 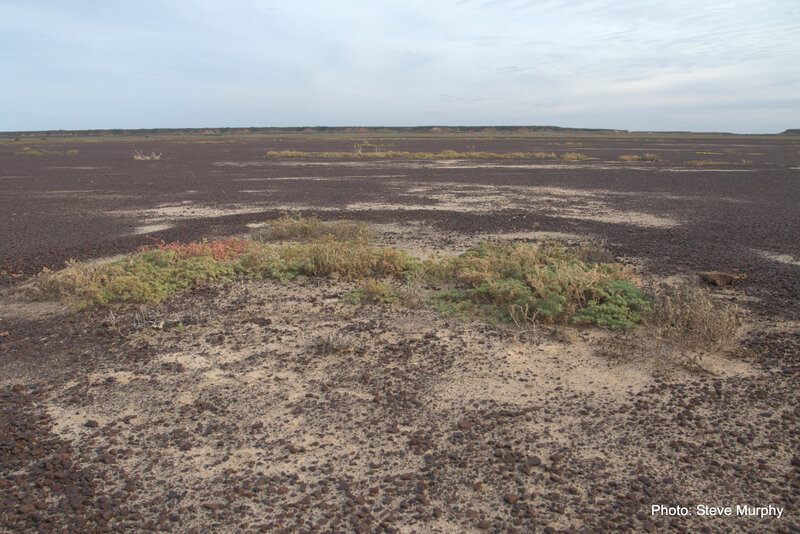 Early naturalists reported that Night Parrots do call when coming in to drink, although no Night Parrot calls were recorded at a known drinking spot during a 3 month sampling period. Night Parrots are known to call when feeding in non-Triodia habitats, such as floodplains. Night Parrots are known to use areas that have a mix of Triodia, alluvial and stony pavement (sometimes called gibber) habitats. 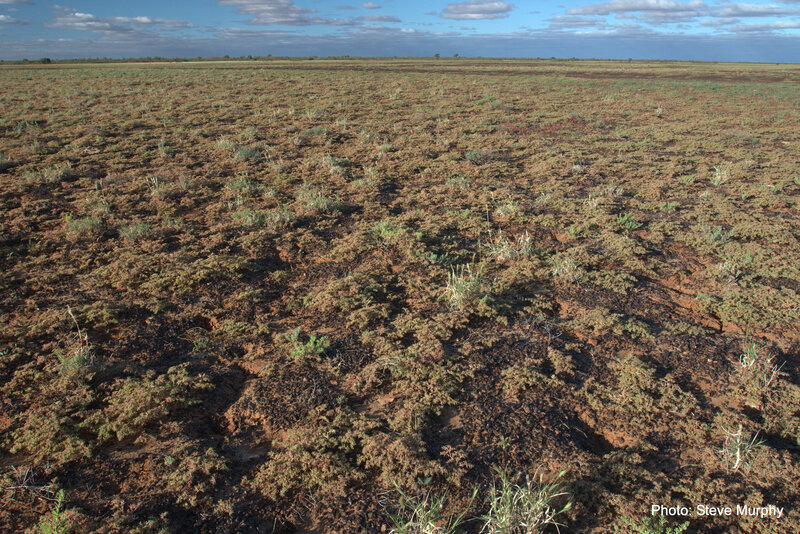 All recent Night Parrot records have been associated with Triodia longiceps but other Triodia species might also be important. Triodia longiceps growing near escarpments and without high densities of trees or shrubs might be favoured, although some Night Parrots have been found living in Triodia areas a long way from escarpments. The actual spatial extent of Triodia patches does not necessarily need to be large. Triodia habitats are used for roosting, breeding and feeding, while alluvia and stony habitats are used mainly for feeding. Night Parrots are known to drink at dams and raised earthen stock tanks (often called turkey nests). They are also likely to drink at other free standing water bodies within 10-15km of roosting habitats. Night Parrots normally fly fast and low through the landscape. In low light you may see a green tinge to their plumage but they may also appear quite dull, even grey. Pay particular attention to contrasting patterns in feathers and the overall body-size and shape. Under spotlight, Night Parrots have relatively dull white-ish eye-shine. At night, when threatened by a passing vehicle or person on foot, Night Parrots have been known to adopt a hunched posture and remain motionless. Take written notes about suspected encounters as soon as possible. In addition to recording a physical description and any observed behaviour, also record the exact location, date and time of day. See night parrots at different life stages. Ultimately, Night Parrots will be saved when we know where they occur and the appropriate conservation management actions are implemented. 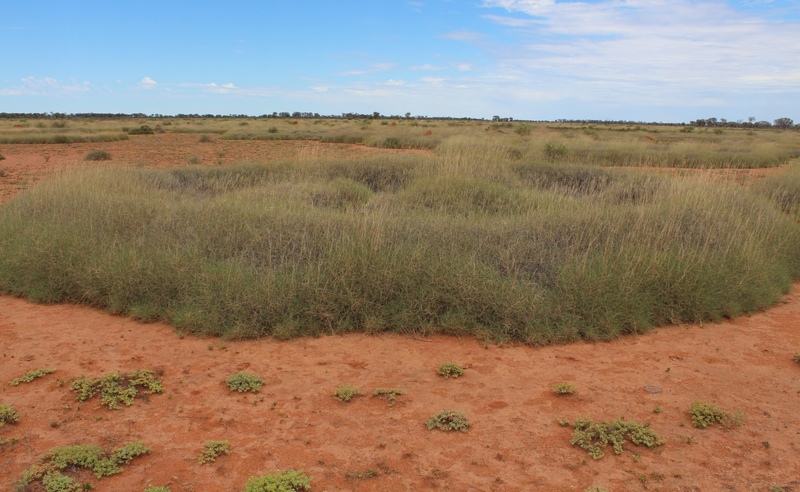 The species is likely to occur across a range of land tenures, from national parks and reserves, to Aboriginal land and private grazing leases. Successful implementation of management actions will rely on the support of land holders, state agencies and conservation groups. Please remember that permits are required for entry into some areas, such as Aboriginal lands. The Night Parrot Recovery Team asks anyone who has heard or sees Night Parrots to make contact through: nightparrotrecoveryteam@gmail.com. Your observations will be kept confidential and where appropriate, the NPRT will facilitate conservation actions in consultation with yourself, the land holder, state agencies and conservation groups. If you do have a permit to use playback, please tell us where you have used playback without finding Night Parrots. Do not try to flush Night Parrots during the daytime. Doing so will expose individuals to diurnal predators and potential heat stress. The use of call-playback is not encouraged by the NPRT without the appropriate permits. Call-playback is considered a potentially disturbing research technique and people wishing to use call-playback should seek advice from relevant state wildlife permitting authorities and animal ethics committees. Further guidance is provided in BirdLife Australia’s Ethical Birding Guidelines: (http://www.birdlife.org.au/documents/POL-Ethical-Birding-Guidelines.pdf). 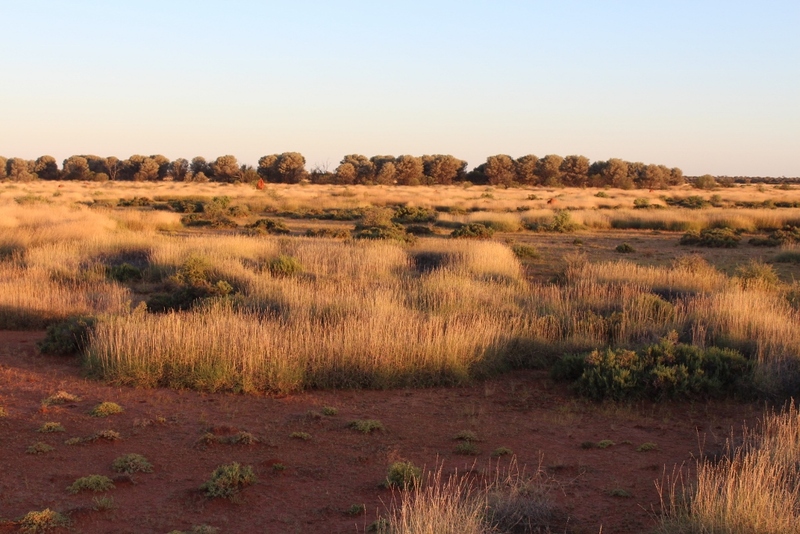 Do not enter private land or Aboriginal land without permission (note that non-compliance can result in penalties and make it more difficult for other observers or researchers). Seek advice from National Parks’ agencies about accessing protected areas. Night Parrots typically occur in remote areas that can be hot, and distant from water and help. Make the necessary preparations and take the necessary precautions when travelling through remote areas. 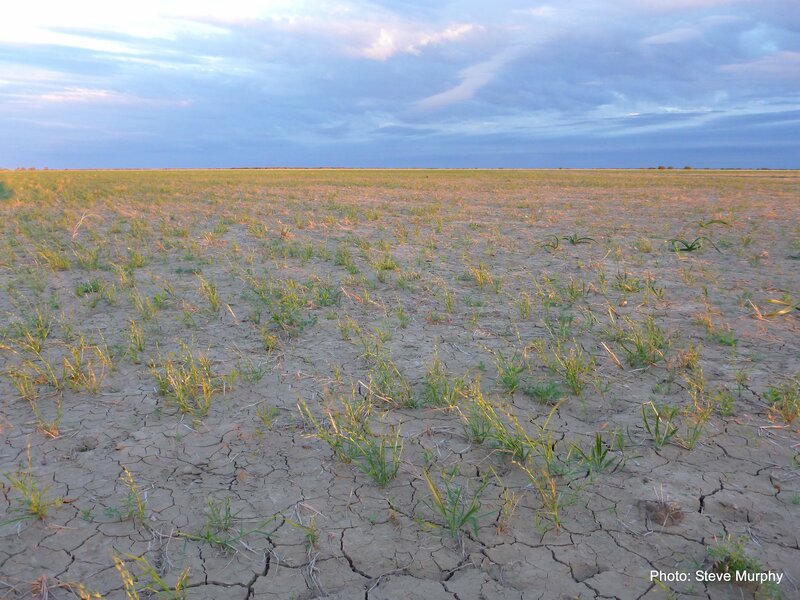 If you would like to undertake research involving the Night Parrot, please contact the Night Parrot Recovery Team and the relevant state conservation agency.